This was the first CIG eforum that I’ve taken part in. I usually struggle to fit eforums into my day but I couldn't resist this topic, which is near and dear to my heart (and my dissertation research). The opening topic focused on personal use of social media, and Twitter in particular. Many people said that they found it an invaluable tool for learning about new developments and opportunities. I agree with those that said it made them feel very much part of a community. I set up my own Twitter account a couple of years ago but I've only really been an active user for the last year or so. I could never really see the point when I started, but since then I've found it an invaluable tool for professional development. I've found out about conferences and training opportunities but also just the day to day "news" of the cataloguing world and it's something that I think I would struggle to be without now. Other people echoed this view, saying that without Twitter they would have been out of the loop and missed out on events and opportunities. There was a lot of discussion over whether to keep Twitter accounts private or not. Personally I keep my account open because I think that it misses the point of a social network if you don't. Some people pointed out that it can be hard to follow the conversation if someone has a locked account since you can’t see all the tweets. I know that this has happened to me when trying to follow a conversation and it’s frustrating. Having said that, I’ve been getting more and more spam followers in the last few months so I can understand why people lock their accounts. Someone suggested that those just starting out begin with a locked account and then see how they go – sound advice. There was also discussion of Twitter and other social media tools for work purposes. Some people used social media for their jobs but others had restrictions that meant that this wasn't an option. Popular tools used for work purposes included blogs and Facebook pages. Some people are using social media to keep colleagues up to date internally. Some institutions do this already and I know that I find it really useful. Ours is used to store information about cataloguing procedure that used to be sent out via email. This often meant that people knew they had received an email about something but couldn't find it when they needed it. Now, we can just search the blog and the information is there! It was pointed out that one of the main benefits of any form of social media for cataloguers is that it can bring them together. I’m lucky enough to work in a large cataloguing department with lots of people on hand to offer advice and support but not everyone is that fortunate. For solo cataloguers in particular, social media can be a lifeline. Some cataloguers use Twitter to ask work questions and the speed at which these are answered never fails to amaze me. Cataloguers on Twitter are always so eager to help (much like in real life!). There was also discussion over whether to have separate Twitter accounts for personal and professional use. My Twitter account (like most of my social media presence) is meant to be strictly business but there are the times when it lapses into more personal territory! I think that letting your personality show through in tweets or other social media will help to engage your followers, whether your account is personal or professional. I’m researching users opinions of library 2.0 at the moment and the comments so far all seem to suggest that they like the more ‘human’ face that social media puts on the library and its staff. I think constant ‘business’ tweets would seem a bit inhuman and undermine this benefit. One of the issues raised was how to fit all of these tools into the day, especially if your access if restricted. I admit that I struggle with this. I think the best thing to do is to try a variety of tools and then pick the one(s) that work best for you and devote your time to them. 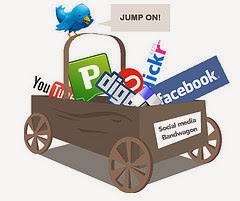 I use Twitter everyday and I find that this leads me on to blogs and other posts which I find useful. Sometimes the last thing that people want to do after staring at a computer screen all day is spend the evening reading blogs and Twitter feeds. Twitter was compared to a river – you just have to go with the flow and read a snapshot of the tweets available at the time you are reading it. Otherwise I think people who follow more than about five people would go mad! Social media training was also discussed. Whilst some had formal training, most people seemed self-taught and others came to use social media through various 23 Things programmes. I would recommend these programmes for anyone who wants an introduction to social media tools. Cam23 and cpd23 are just two of the recent programmes that I know of and although they are over, the how-to posts remain up. I think that these tools are best explored rather than taught, but that’s just my opinion. The use of social media in catalogues was another topic. I have no experience with this so it was really interesting for me to see what others do. Tagging seemed to be the most talked about tool but there was a debate over how popular this was with users. I've read research which seems to suggest that users find it useful but don’t value it as much as controlled language subject headings. I work in a legal deposit library and get all sorts of material across my desk. Sometimes I think that it would help to have some outside input, especially with something mathematical and complicated, but I think that user based tagging has a LONG way to go before it can compete with the established subject headings systems. One question asked was how people feel about social media and conferences. I know that I find conference blogs and tweets invaluable when I can’t get to an event, but some were worried that it would be anti-social to tweet from a conference. I think that although it can be annoying for some it's becoming more and more the norm nowadays and the advantages of being able to keep in touch far outweigh the disadvantages. Some people raised concerns over the ownership of social media content and issues surrounding privacy. I think that this is an interesting area which deserves more thought. Most people are aware of privacy issues but I must admit that ownership isn’t something I had given much thought to. I’d like to think that since I created the so-called intellectual content of this site that it belongs to me but maybe not? Something worth looking into/thinking about. Many useful suggestions were made about using social media for work as well as personal purposes. A Twitter marathon for cataloguers was suggested to highlight the variety of material that gets catalogued in a single day. I think this is a brilliant suggestion and I hope that it’s one that gets taken up – I know I’d love to be involved! Overall the discussions raised some really interesting points and ideas that hopefully will get taken forward in the future. There were even some non-Twitterers who may have been converted which is possibly the best outcome of all! Thanks for this write-up Claire. I haven't managed to make it to any of the eforums yet, so it's nice to be able to find out what went on (hurrah for social media!). And that Catalog(u)er Roll Call Tumblr is a brilliant distraction! Thanks Katie, I've been trying to resist posting things to Tumblr all week!